Have you ever wondered what your dog would tell you they wanted for the holidays, if only they could talk? Well, yes, food, food, and more food. But maybe they’d be a little more nuanced than that! Regardless, since they can’t talk, we need great ideas on what to get our puppy friends from somewhere else. 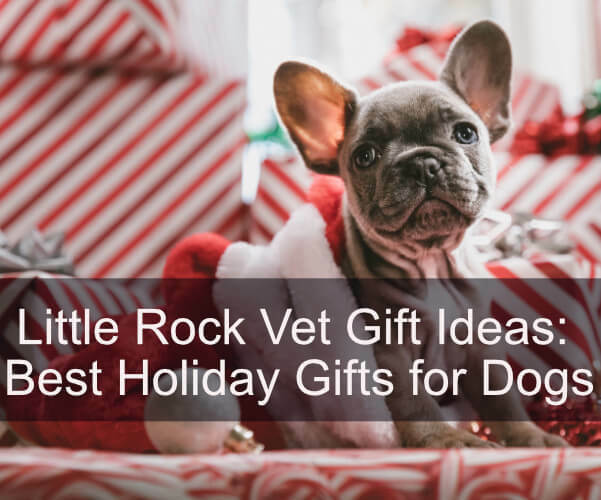 As you local Little Rock vet, we have a few ideas. Take a look at these fun gift ideas for your furry friend. They’ll say thank you in wags, wiggles, licks, and love! Dogs love to chew, but there are a lot of things that we want them to keep out of their mouth! The best way to accomplish this is by giving them bones and toys they can chew. Many dogs love bones and even stuffed chew toys. Why not bring home a new one or two this holiday season? Be sure to monitor your dog if you give them rawhide or other edible toys. There’s a chance they could bite off a piece and choke. We love your pets – we don’t want to see them at a Little Rock vet due to choking! If your pet is more destructive, choose well-built chew toys rather than stuffed. There are a variety of pet brands that focus especially on power chewers. It’s always heartbreaking to see one of our Little Rock vet customers posting a notice that they’ve lost their dog. We help however we can, and we certainly hope they are found quickly. Consider how much easier it would be, though, if you had a GPS collar for your dog. You could know where your precious pet is and find them quickly. This is a gift for both you and your dog – to keep you together, safe, and sound during the bustle of the holiday and beyond! Dogs love to work and many of our pets are incredibly curious and intelligent. While we may not have a specific job for them, we don’t have to let them lay around bored either. Instead, get a puzzle bowl or other puzzle toy to help them stay active and engaged, no matter what the day brings. Figuring out how to find the treats or food is interesting and gives them an immediate reward when they get it! Monthly clubs are incredibly popular, and there are so many options it’s dizzying. There are several clubs designed just for your furry family members too. Consider a monthly toy club, unusual treats, or other fun dog-related gifts! It the gift that keeps on giving throughout the year, not just at the holidays! Your Little Rock Vet is Here For You! We hope that your family is safe, healthy, and happy throughout the holiday season and beyond. However, if something does happen, we want you to know that we’re here for you. At Bowman Road Animal Clinic, your Little Rock vet can check your dog for health problems, treat injuries, and investigate unusual behavior. We can even groom them to get them ready for a special photo shoot or party! If your dog needs some help, contact us for an appointment today!